Earlier this week, manicotti disposal service Olive Garden announced its “Never-Ending Pasta Pass,” a card entitling its bearer to the “VIP” experience of impressing teenagers in sauce-crusted neckties with their stamina for butter and cheese. Naturally, those cards were gone in a matter of minutes. But for those who feel as though they missed out, don’t worry: As with so many vaguely Italian, vaguely legitimate businesses, there is now a bustling, shadowy black market along the back alleys of the Internet, where such power can be had—for a price. As Grub Street has pointed out, many of those $100 passes are now for sale on eBay and Craigslist, where gypsies and thieves have absconded to turn a tidy profit and/or trade sexual favors for this once-pure publicity stunt. Most of the cards now go for between $150 and $300, with “Buy It Now” prices squarely in the $250 range, for those who don’t wish to waste valuable eating time on haggling. 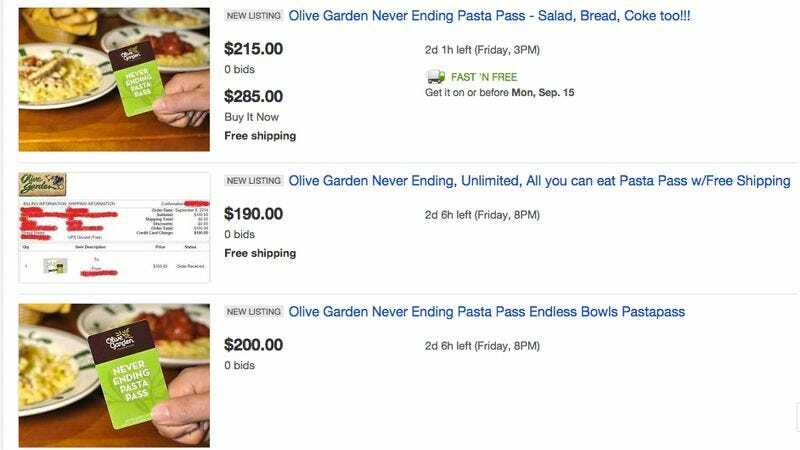 Some people are even offering two unlimited Never-Ending Pasta Passes at once—hinting at a backstory that rivals “For sale: Baby shoes, never worn” in its tersely conveyed heartbreak. Of course, there are some who would say that it would be difficult to make use of even $100 worth of free Olive Garden food, that man’s reach may far exceed his grasp—particularly as he reaches for more breadsticks, and his hands are already buttery from all those other breadsticks. But as any addict will tell you, much of the thrill of unhealthy behavior—whether it’s mainlining heroin or alfredo—comes not from the drug (or the pasta), but from the illicit nature by which you had to acquire it. So go on and purchase a purloined pasta pass, then walk into Olive Garden feeling like a straight-up gangster. That way at least something about your experience will be authentically Italian.